A look at what's happening around the world of "Lit Villages" with a TVC view. The Village Collector has passed the 10,000 Unique Visitor milestone in just over four months. 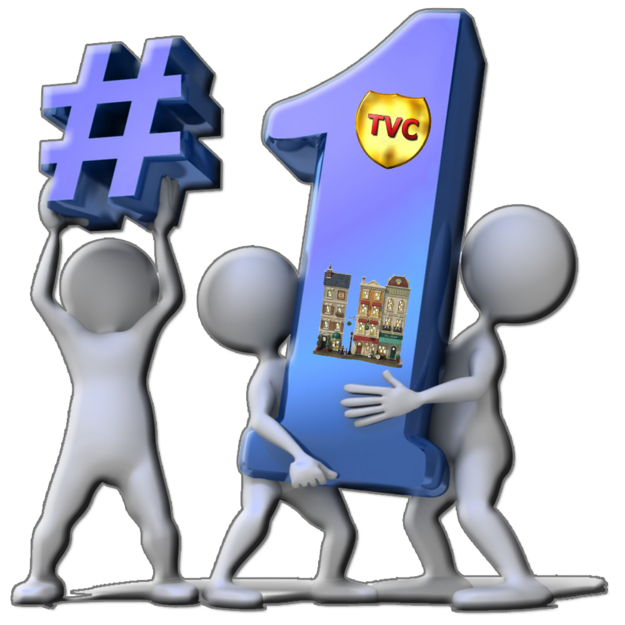 We believe this makes us the current number one independent lit village website. WE HAVE THE GREATEST VILLAGERS IN THE WORLD HERE! We've become the newest "xxxx". In the coming months, I feel you'll be seeing more about this. A lot has been planned here, and with this community's help, we'll surely improve the "Inspiration, Information & Fun" for collectors - especially those that prefer not to use social media. "Box set includes lit house, accessory, tree and snow. Welcome to The 56 Street Brewery, home of the finest craft and micro brews in town. Come inside to enjoy your favorite draft, or if it's warm outside, sample a flight on the upper deck." "A lot has happened this year including the launch of our new web site at www.lemaxcollection.com With feedback from our fans and collectors, we made the images bigger, the web site faster and the layout easier to view on a mobile and desktop device. With Halloween, Thanksgiving, and Christmas just around the corner, we are extremely excited to introduce over 225 new products for the Spooky Town, Holiday and Christmas Village line of Lemax products." "As ghosts and ghouls start to awaken from their summer slumbers, we're excited to unveil our newest 2017 additions to the Spooky Town Village Collection. From haunted mansions, to creepy cemeteries, they will make your Halloween village as bone-chilling as ever." The "Dead Fraternity" is a great example they use to promote this year's new releases. Another cool offering from Lemax, with vultures flying over the roof, zombies moving in and out, tilting kegs with zombies, and silhouettes fading in and out in the windows. Complete with sounds. Gotta love it. I can't read it all, but what made it interesting to me was that it was the first fiction book about Villaging I've seen. Plus, A Limited Edition book held to only 50 copies! WOW - now THAT'S a Limited Edition! There are lots of fans of full, immersive, all-inclusive, animated lit displays. A few villages consisting of groups of this style building displays were featured in our Village Video weekly showcase. The animation and lights looked awesome in a darkened room. Really cool. "Holiday Living Animatronic Lighted Musical Snowmobile Slider"
"Lights up, moves and plays: "Jingle Bells", "We Wish You a Merry Christmas", "Silent Night", "Deck the Halls", "Joy to the World", "The First Noel", "Hark! The Herald Angels Sing" and "O' Christmas Tree" 6-ft cord with DC adapter included." Proving that Lit Villages come in all sizes, price points, and styles, Costco offers a complete village for about the price of some single buildings. Those on a budget can find lots to enjoy here. "Warm Holidays glow with nostalgia within this charming Town Square scene. Tradition abounds in every detail of this piece, from the children at play in the snow to the spires of the church. Enjoy this reverent centerpiece this season and for many years to come. Features 8 different songs: "We Wish You a Merry Christmas", "O Christmas Tree", "Jingle Bells", "Deck the Halls", "The First Noel", "Joy to the World", "Hark, The Herald Angels Sing", and "Silent Night". 30-piece Set Includes: 3 Lighted Buildings, 1 Musical Tree, 10 Trees, 14 Figures, & 2 Lamp Posts.
" 6" Resin Christmas Scene Village Houses With Warm White LED Light Battery Operated Christmas Ornament Holiday Gifts"
"Christmas scene snow white house village. Traditional hand painted finish, with Santa and Tree outside." New this season in the Lemax offerings is this neat coffee company - this looks so cool that maybe even David Spears would take up drinking coffee. Well, maybe not, but it IS a wild looking building. Amazing details. "For your Christmas and Holiday villages, the Vintage Grind Coffee Company and Bell’s Gourmet Popcorn Factory bring an inviting feast for the senses. For something a little sweeter, why not add Stephanie’s Sweet Shoppe from the irresistible Sugar N Spice collection. 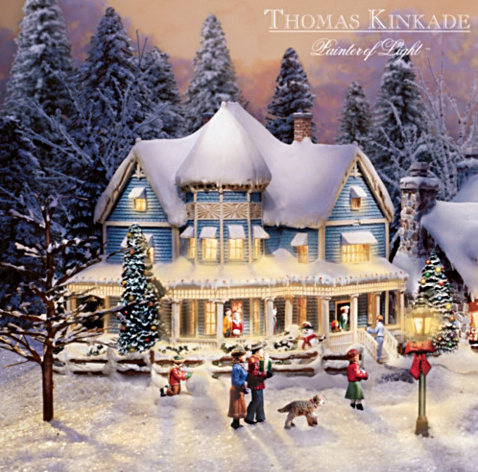 "Let the glow of Christmas become a bright tradition in your home with this First-ever limited-edition Thomas Kinkade Christmas village collection! This welcoming holiday wonderland begins with Issue One featuring the Holiday Bed and Breakfast and FREE Gift Bearers figurine. Soon you'll be basking in the warm glow of Issue Two, Light of Hope Church and a FREE antique car figurine. Additional village buildings, each a separate issue and some with select free figurines and accessories, will follow. A Hawthorne Village exclusive inspired by the work of acclaimed artist Thomas Kinkade, each of these unique Christmas decorations is handcrafted and hand-painted for exceptional realism. You'll love every detail, from the snow that blankets each building to the festive Christmas decorations - even the buildings' textured siding and stonework look real. Plus, every lighted building bears a replica of Thomas Kinkade's signature." "A collecting FIRST and a unique Christmas decoration inspired by the original works of renowned artist Thomas Kinkade and available ONLY from Hawthorne Village.Included FREE - Gift Bearers figurine with Issue One, antique car figurine with Issue Two, and additional select FREE figurines and accessories with subsequent issues. Each illuminated, sculpted village building in your collection is expertly handcrafted in three dimensions of artist's resin, and hand-painted for intricate detail and exceptional realism. Inscribed on each lighted sculpture is a replica of Thomas Kinkade's signature." "You know there's a game to be played when the New England Patriots take to the field. With multiple Super Bowl victories and a legion of fans sporting the beloved silver and blue, this team is unstoppable. Celebrate their incredible success with a Market First collectible New England Patriots football Christmas village collection." Officially licensed holiday village with team colors, logos, light-up Patriots stadium and more. FREE figurines and accessories, Stadium - The Main Gate measures approximately 5-1/2" H.